Still Flirting With A Run, Palin Confronts Deadlines And 'Smears' : It's All Politics As Sarah Palin keeps the GOP guessing on her White House intentions, she faces challenging filing deadlines and dismissed allegations in a new book as "disgusting lies." This week, Sarah Palin kept the guessing game about her White House intentions alive. She weighed in on the Republican presidential debate. She took to task her old buddy and White House hopeful, Texas Gov. Rick Perry, for his past support of a program to vaccinate girls against a sexually transmitted and potentially cancer-causing disease. She denounced a risqué "tell-all" biography of her by author Joe McGinniss set for release next week, even as the salacious bits leaked out this week and excerpts were parceled out in Garry Trudeau's "Doonesbury" comic strip. And to top it off, she faced the prospect of another unflattering new book by the estranged father of the Palins' first grandchild, Tripp, son of Bristol of "Dancing with the Stars" fame. Levi Johnston's offering, Deer In The Headlights, is also due out next week. As Palin continues to hint that she might join the pack of GOP hopefuls, the media glare is intense, and not always shining where she might like. Reince Preibus, chairman of the Republican National Committee, said in an interview this week with ABC News that though he's "very satisfied" with the current GOP presidential field, it's not too late for someone to jump in. But Preibus must know that the clock is ticking pretty loudly. "There's no barrier from jumping in if that's what she wants to do," says primary expert Josh Putnam of Davidson College. "But with each day that passes, a little more of that door closes." Putnam acknowledges that Palin's narrative has always been "unconventional politics," that the usual rules of the road don't apply to her. And though Palin hasn't missed any primary filing deadlines, he sees her prospects as already decidedly limited. "This has turned into a fight between Romney and Perry," he says, and the way the primary system is set up, front-loaded with big contests, means that "it's grown less likely for folks to jump in midstream." The Republican National Committee has no rules about how many primaries or caucuses candidates are obligated to compete in; they just have to win enough delegates to capture the nomination at the fall convention. Though the primary calendar is still in flux, perhaps the best guide for Palin's drop-dead date to jump into the race was provided by columnist Jim Geraghty of the conservative National Review. Since the winner of the South Carolina primary has always gone on to win the GOP nomination, Geraghty has written, Palin has to get in by Nov. 1, the filing deadline for the Palmetto State contest. That means Palin has a good six weeks to continue to tease about her intentions. Although she's not a candidate, Palin had been invited to participate in last Monday's GOP debate in Florida, sponsored by CNN and Tea Party activists. She declined, but fueled — again — speculation about a possible run by criticizing Perry, with whom she forged a friendship while serving her abbreviated term as governor of Alaska. Palin campaigned for Perry when Texas Sen. Kay Bailey Hutchison challenged him in a 2010 gubernatorial primary, and once wrote this about Perry: "He does what is right regardless of whether it is popular. He walks the walk of a true conservative. He sticks to his guns — and you know how I feel about guns!" Perry's former chief of staff was a lobbyist for Merck, the drug company that produced the vaccine, at the time of the governor's decision. 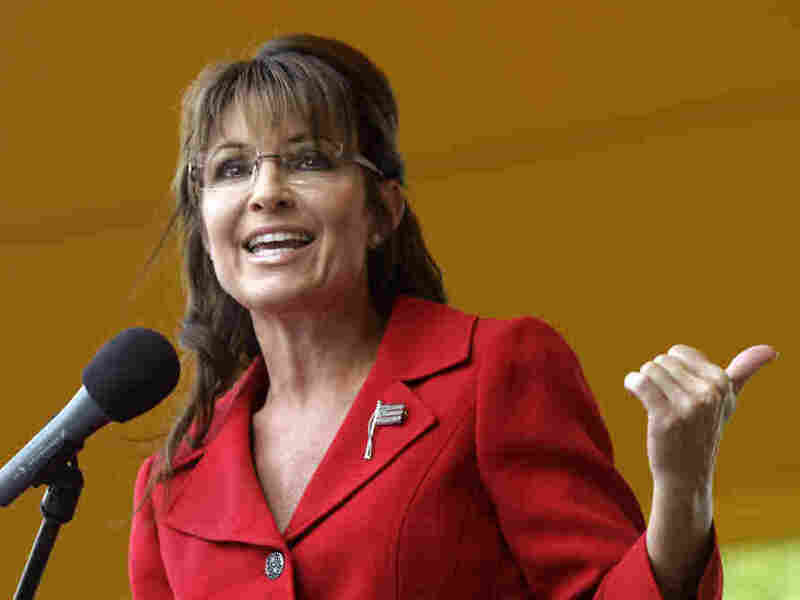 Her language echoed that used by Rep. Michele Bachmann (R-Minn.) in criticizing Perry during the debate. That put a fork in what was once considered a dream team in some conservative circles: a Perry-Palin ticket. Or was that supposed to be a Palin-Perry ticket? The tabloids feasted on the salacious allegations about Palin's private life in the leaked excerpts of the McGinniss biography. A handful of newspapers, including the Chicago Tribune, refused to run the "Doonesbury" strips that contained book excerpts read by the panel's characters. And Palin and her husband, Todd, lashed out at the tome as a collection of "disgusting lies, innuendo and smears." Trudeau fired back, telling the Washington Post that the book was "meticulously reported" by McGinniss, who famously rented the house next door to the Palins while he worked on the book, The Rogue: Searching for the Real Sarah Palin. Reviews have not been so kind. Janet Maslin of the New York Times, in a piece titled "Sarah Palin Could See This Guy From Her House," dismissed McGinniss' effort as a collection of "caustic, unsubstantiated gossip" that's also "dated, petty and easily available to anyone with Internet access."